Say what you want about packed coffee, it doesn’t even come close to the taste of freshly ground coffee and that’s a fact. 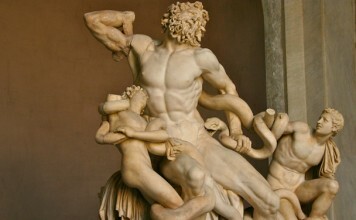 Many people already know this, you see, which is why many coffee enthusiasts prefer to grind their own coffee. A good way to do that is with the help of an electric coffee grinder which is guaranteed to get the job done twice as fast as a manual grinder would. Having said that, we should point out that there are many coffee grinders out there to choose from and that they’re not all built to meet the same high standards. For this reason, we thought it would be a good idea to make a list of the ten best electric coffee grinders money can buy. Thanks to its clear top cover and one-touch controls, you can operate this particular coffee grinder to the full extent of its capabilities with just the touch of a button. Speaking of its capabilities, let us point out that this coffee grinder uses a heavy-duty electric motor that will grind enough coffee beans to make up to 12 cups of coffee on a single load. Not only that but it also features a detachable bowl that makes it easier for you to transfer grinds to the coffee maker as quickly as possible. Equipped with 18 custom settings for grinding, the Mr. Coffee BVMC-BMH23 is an automatic burr mill grinder with a removable bean hopper. This affordable device can hold up to 1 a pound of coffee beans at once and contains a detachable grinding compartment and a handy cord storage facility. The bean hopper can easily be installed onto the main unit and with a few clicks clockwise, you can set the machine to grind your coffee as per your requirements. 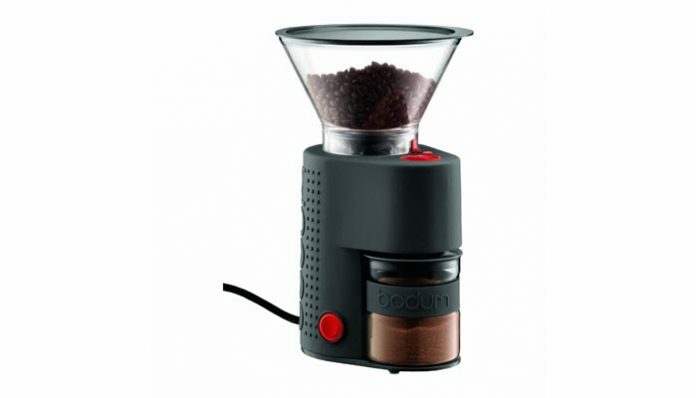 The Bodum Bistro Electric Burr Coffee Grinder is a durable, compact sized kitchen accessory that comes with 14 various grinding settings adjustable from coarse texture to fine. The glass catcher on the top of the device is made from Borosilicate that keeps the coffee beans from jumping. It also comes with a unique timer for grinding as well as a quick grind option allowing you to perfectly grind the amount of coffee you require. 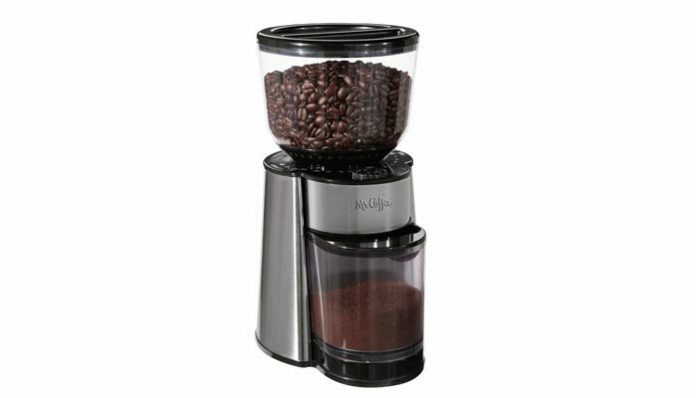 The special burr grinder can be adjusted to give you the perfect grind for your favorite cup of coffee. The Mr. Coffee IDS77 grinder is a well designed electric coffee grinding machine that comes equipped with an easy to use “press and pour” lid to make things easy. The wide open design is perfect for filling and preparing to eliminate messy countertops. 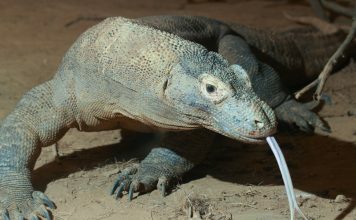 It also comes with the latest Chamber Maid Cleaning System that sweeps the walls quickly. The grinder can grind enough amount of coffee for up to 4 to 12 cups at once. The device also comes with special grind settings that can be set to coarse, medium or fine. If you are looking for performance and high quality in a budgeted price range, then the Proctor Silex E160BY coffee grinder is the perfect choice for you. 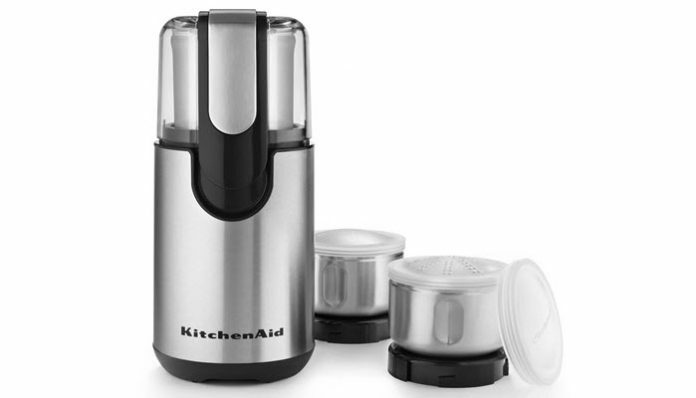 Featuring a special on/off safety button, a retractable cord, and top-notch durable stainless steel blades, this product is extremely easy to clean and can grind coffee at very high speeds. 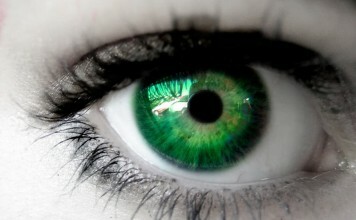 Furthermore, you will find this device to be quite affordable given its high-end capabilities. 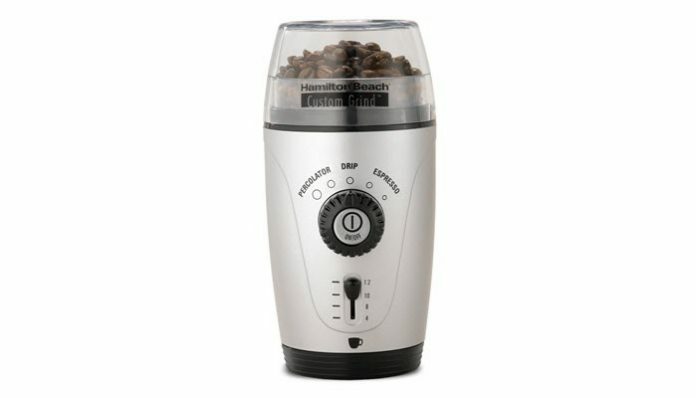 The Hamilton Beach 80365 is a Custom Grind Hands-Free Coffee Grinder featuring a detachable grinding chamber that is perfect for easy filling and cleaning up. This device can be used for coffee grinding as well as for spices and comes with 5 different grind settings. It features special settings for the number of cups required and the fineness texture of the coffee grounds. Also worth mentioning is that it comes with a handy hands-free mechanism and also contains a storage space for the cord. 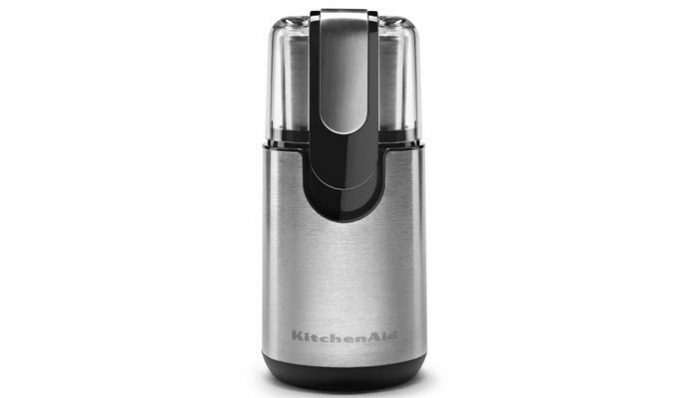 Considered as one of the most popular coffee grinders among many, the KitchenAid BCG111OB comes with a transparent cover with unique single touch control for easy operation. Equipped with durable stainless steel blades, this device offers optimum performance thanks to its heavy duty powerful motor and can make up to 12 cups of coffee at a quick speed. The grinder includes a detachable 4-ounce bowl with measured markings on the sides to see how many cups of coffee you would be making. The bowl can also be lifted off making it easier to transfer the ground coffee to the coffee maker. 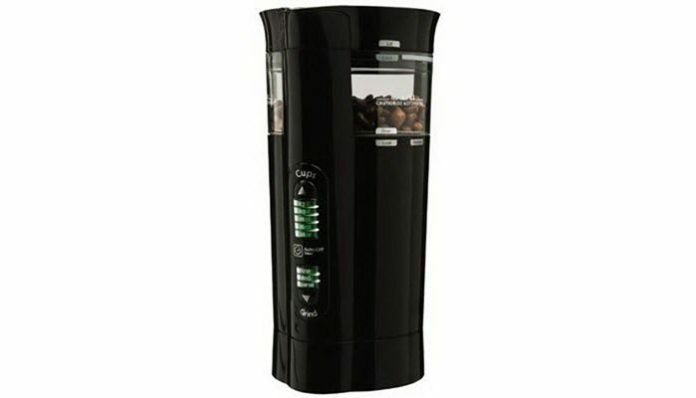 The Capresso 560.01 Infinity Burr Grinder is a 100-watt cone shaped burr grinder that comes with 16 different grind settings. The cone shaped burrs make sure that the maximum amount of flavor is brought out of the coffee when ground. The container for coffee beans holds up to 8 1 ounces of beans and the grounds container holds up to 4 ounces. Featuring an in-built timer, this coffee grinder is durable and extremely easy to clean. 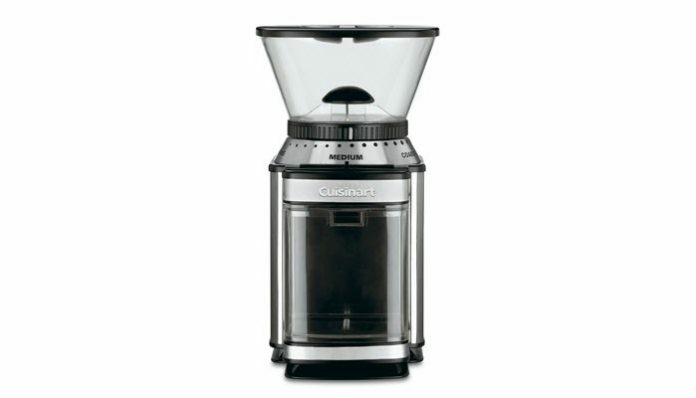 The Cuisinart DBM-8 is a Supreme Grind Automatic Burr Mill coffee grinder that is extremely elegant, uniquely designed equipped with a robust motor. The special grinding mechanism ensures the best flavor from coffee with the best texture. The device features 18 various grinding options that range from course texture to fine. It also includes a slide dial allowing you to select from 4 cups to 18 cups, and a spacious grinding chamber with a durable lid. 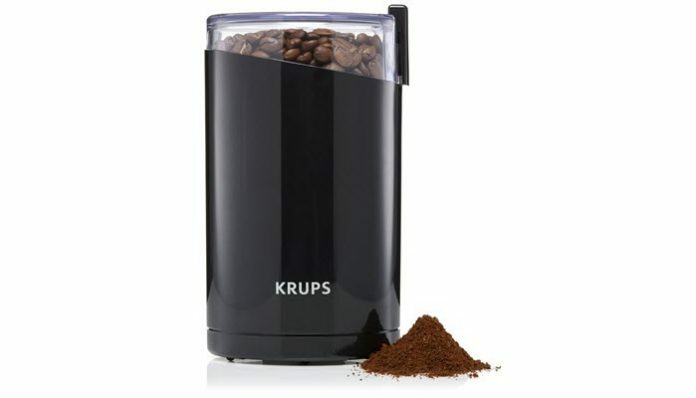 The KRUPS F203 is a heavy duty Electric Spice and Coffee Grinder equipped with durable Stainless Steel Blades and very user-friendly controls. Featuring a 200-watt motor, this coffee grinder will operate at a very high speed and can grind up to 3 ounces of beans in just a matter of seconds. 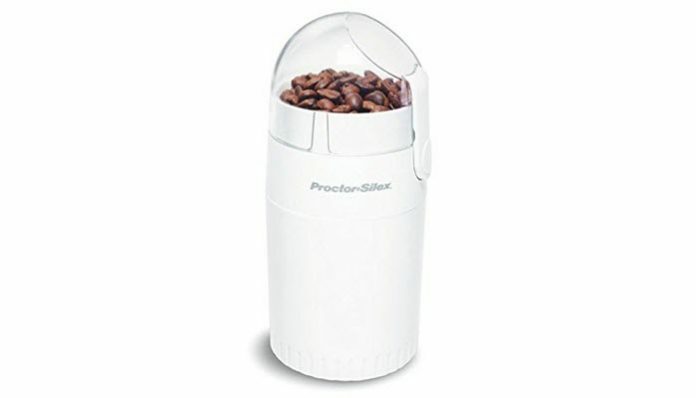 Its unique oval shaped construction and stainless steel blades will process coffee beans of any size with relative ease. 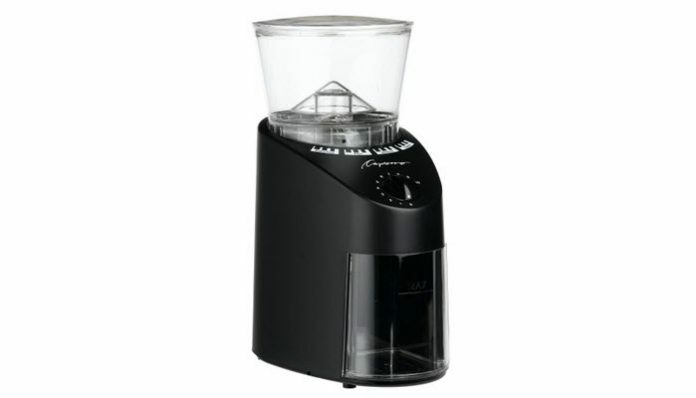 Not only that but compared to other grinding devices, this grinder will also help you with the grinding of herbs, spices, nuts, grains, or anything else you might want to grind. Overall, it is perhaps one of the best coffee grinders the market has to offer at this point in time.